apply a coat of Chink-Paint Smooth. 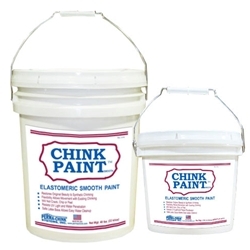 Available in 8 Perma-Chink colors. Great product and easy to use! I have Perma-Chink white chinking between my logs and it was looking somewhat dirty and dingy since our contractor applied it a few years ago. I saw the Smooth Chink Paint online and decided to tackle this project myself. I applied it with a small brush and now my chinking is bright white like it used to be. Love it!